wallhanging: 39"x39"; personal throw: 50"x50"
In 2005, I made a machine-embroidered quilt, which I called "Zundt Corners", after the company that digitized the embroideries. 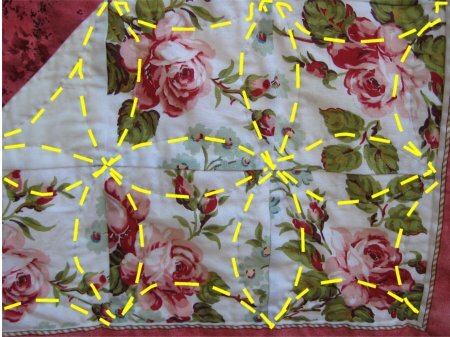 I taught Zundt Corners as a quilting class and included 2 alternative, non-embroidered versions as well, for those potential students who might like the layout but didn't have an embroidery machine or access to one. One alternative was a smaller, wall-hanging size and the other was a personal, throw size. I never got around to finishing the alternative versions in 2005 and they have languished. In preparation for this trip, I used the wall-hanging version as a guinea pig for my next attempt at long-arm quilting on a real quilt (instead of practice pieces of fabric). You'd think that I would choose something relatively SIMPLE for this attempt .. but oh no ... let it not be said that I fear to tread dangerous waters! I decided that this layout deserved feathers. Yes, feathers .... one of the more difficult things to be done with a long-arm machine. Now, in my defense, I've done feathers on my home machine, so I am familiar with what SHOULD be done. But translating that to a long-arm machine is a little different. :-) Some of the feathers came out nicely. Some did not. Some sides came out much nicer than other sides and some spines look a whole lot better than others. 2) this was the state of my (lack of) skill on my longarm at this point in time. big feathered heart in the center medallion. I also learned how to use a straight edge with my long-arm to get nice *straight* lines. The heart at the base really turned out lopsided. Feathered arcs are in the green print border. 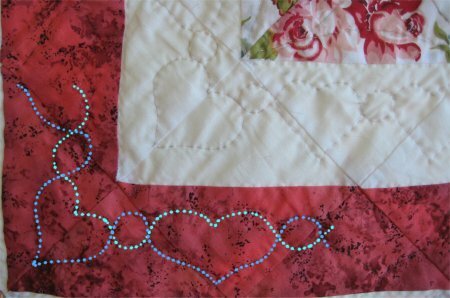 I put hearts in the corners of the quilt and in the middle of the border to break up the feathered arcs. Once again, those hearts came out weird. So, with the quilting done prior to the trip, I used part of my road trip to hand sew the binding in place. When I returned home, I sewed on the casing for hanging the quilt on the back, as well as the label. 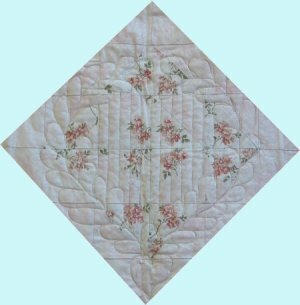 This quilt is the same layout as the wall-hanging (and, in fact, is the same layout as Zundt Corners) but different fabric choices. 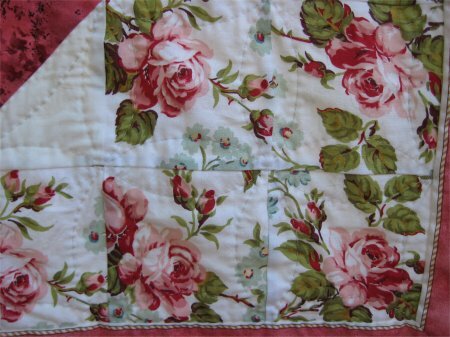 For this quilt, I choose a luscious floral stripe as the border and (one of my favorites) Fairy Frost as the solid. I didn't have enough time before our trip to do any more longarm quilting ... and as I was apprehensive about running *out* of handwork to do on the trip, I decided, in another bout of bold fearlessness, to hand-quilt this one. Now, I am NOT a hand quilter. I've done a couple of baby quilts before so I know that if I can't do the perfect 10-stitches-to-the-inch at least I can be consistent with the stitches I do make. Because my daughters like very drapeable quilts from the git-go, I decided to back this top with a creamy white fleece, which would serve as both batting and backing. To stabilize everything before I began the detailed quilting, I did a hand-done stitch-in-the-ditch along all straight edged seams and a large basting stitch around the perimeter. Because some of the quilting would be in a large scale floral print and would essentially be lost, I elected to do a very basic orange peel quilting design in those areas. The quilting thread is an off-white. In the white band and pink band areas, a heart and circle design was done . 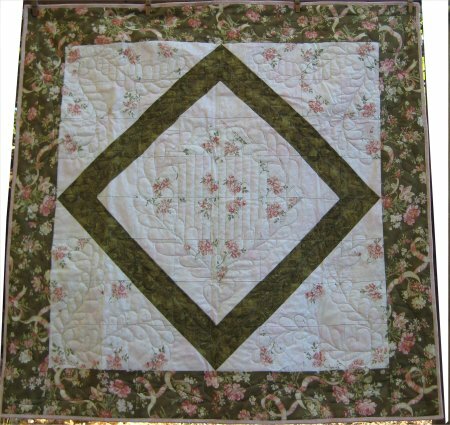 The quilting thread was a very pale pink in the white band and a dark green in the pink band. I was pleased how the quilting showed up in the white band but the dark quilting thread got lost in the dark speckles of the pink band; I should have used the off-white thread. The floral stripe border posed a problem. How the heck was this to be quilted??? Nothing intricate, as it wouldn't show up. I didn't want to do diagonal lines or cross-hatching. What I came up with was a double serpentine wave that followed the main design element of the fabric pattern. Inside the waves, I followed the semi-circular line of that fabric pattern. 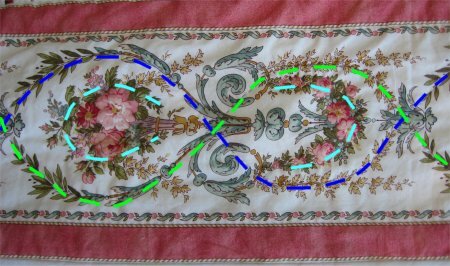 The quilting was done in dark green thread. You absolutely can not see any of this quilting on the front, which is actually what I wanted. 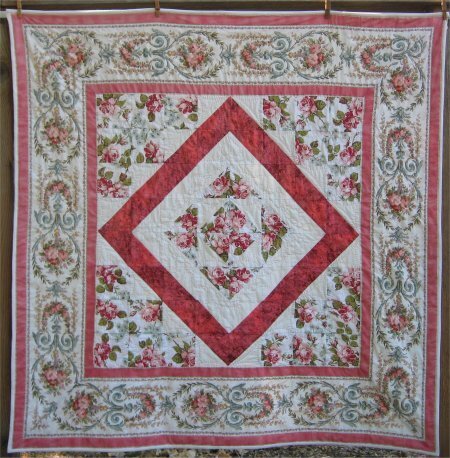 I was able to quilt the entire center medallion on the trip .. remember, I'm quilting in the car, as we are driving along very boring scenery, taking breaks from the quilting when we reach a spot in the road that is interesting. It's not like I was quilting for 8 hours a day! 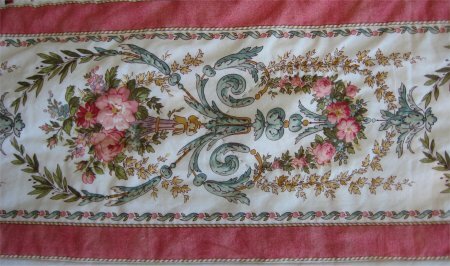 It wasn't until I returned home that the border quilting and binding were completed. I must say that, although the Quilt Police may turn up their collective noses at my hand-quilting, I am pleased with it. The stitches are even and consistent. They may not be teeny-tiny but they aren't toe-snaggers either.